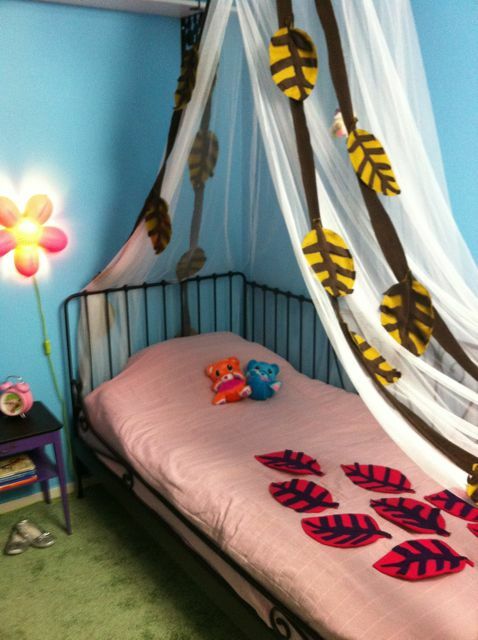 Tiphanie wanted a room with nature inside and also a stage and a kind of circus hammock. She wanted walls like the sky ( I actually ordered a wallpaper with a sky motive and big clouds but she didn’t like it). Tiffen is a collector with lots of stuff – so I build a double storage from two Ikea trofast. She got a stage/lounge area on top. We made leaves out of fleece and felt material. Cupcake decoupage on the chair, chalk board paint on her desk and a little hide- away place under it all. And all of you – I answerd a lot of old comments and questions now – I thought I did it allready but I guess it was in my head! Sorry for keeping you waiting! Newer Post What´s in your bag-tour. JOIN NOW! Older Post Well Jenny -This is in my bag! But I like all of your styling anyway. Thank you so much . how I wished I could translate it all for you! It makes me so unbelieveble happy that you watch it and like it all over the world! And Finda – 2 trofast is not enough but she got shelves and a cupboard. But my experience is that you have to clean it out all the time – I mean sort it out -give some toys away otherwise the rooms will explode!